Heritage Week is almost here! Did you enjoy our social media series? 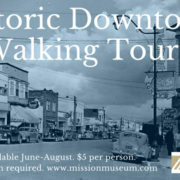 Come and see the artifacts in person! Anthony Taulbut, an avid collector, historian, explorer, and prominent resident of Mission opened Mission’s first museum out of his own house! Some of our most unusual artifacts came to us from Mr. Taulbut’s world travels and insatiable curiosity. Don’t miss this exciting exhibit! Discover the story behind Mission’s first hospital and how the whole community came together to make it happen. New technology for the museum gallery! Supported by the Province of British Columbia through the British Columbia | Canada 150: Celebrating B.C. Communities and their Contributions to Canada grant program., we’ll be unveiling our brand new kiosk stations featuring video content to spice up our exhibits. Come check it out! First Nations Matters exhibit opens next door at the Mission Community Archives. Extended opening hours, February 21-24 only!